On March 20-21, Iran’s top leaders marked Nowruz, the Persian New Year and the first day of spring, with televised addresses to the nation. Supreme Leader Ayatollah Ali Khamenei praised Iran’s resilience in the face of U.S. and European sanctions but also acknowledged that the struggling economy is the “main problem” facing the country. He cited currency devaluation and inefficient management as key issues. Khamenei called for boosting domestic production to improve the economy. “If production is boosted, it can solve livelihood problems, it can ensure the country’s independence from foreigners and from the enemies, it can eliminate unemployment and it can solve the problems related to the decrease in the value of the national currency to a great extent,” he said. In a separate televised address, Khamenei accused Europe of failing to stand up to the United States following its withdrawal from the 2015 nuclear deal, the Joint Comprehensive Plan of Action (JCPOA). He accused Europe of stabbing Iran in the back with its creation of Instex, a financial channel that has yet to facilitate significant trade with the Islamic Republic. It's been repeated recently that Europeans have created #instex financial channel. This is more like a joke, a bitter joke. What they're responsible to do is totally different from what they're doing. Once again, Europeans stabbed us in the back. We can't expect them anything. 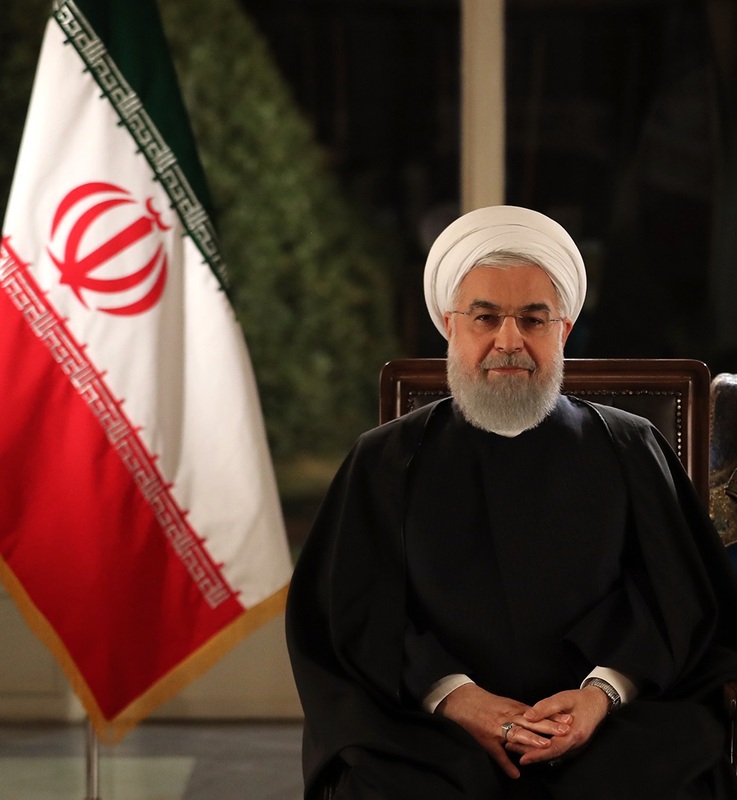 President Hassan Rouhani blamed the United States for the country’s problems but said the responsibility lies with Iranians. “Someone might ask until when these problems and sanctions will be there? I would like to tell the great Iranian nation that problems have started by the enemies and those who have recently come to power in Washington, but the end is at our hands,” said Rouhani. On March 20, Foreign Minister Mohammad Javad Zarif said that the celebration of Nowruz “testifies to the character, spirit and magnanimity of our people that they celebrate amid unprecedented, inhumane and illegal sanctions and pressures.” In a video message, he argued that the United States was using “medieval tactics” to “destroy” Iranian livelihoods. The following are statements by top Iranian leaders. I named the year 1397, “The Year of Support for Iranian Products.” I cannot say that this slogan was fully implemented, but what I can say is that it was well received to a great extent, and in many cases, the people welcomed and acted on it. This will certainly exert its influence. This year, the issue of production is of great importance. I would like to make the issue of production the pivot of our activities. By Allah’s favor, in my new year’s speech, I will explain what I mean by ‘production’. If production is boosted, it can solve livelihood problems, it can ensure the country’s independence from foreigners and from the enemies, it can eliminate unemployment and it can solve the problems related to the decrease in the value of the national currency to a great extent. That is why I believe that the issue of production is a pivotal issue this year. Therefore, the slogan I have chosen for this year is: “The Year of Boosting Production.” Everyone should try to do what they can to boost production in the country. By Allah’s favor, from the beginning to the end of the year, this notion should be completely tangible in the country. If this happens, we hope that the solution to economic problems will be achieved, God willing. I believe that the Persian Year 1398 is the year of opportunities, possibilities and evolvements. Today the enemy is engaged in an economic war against us; we should of course defeat the enemy and we will do so by God's grace. Besides defeating enemies, we must develop deterrence. Enemies should see they can’t find a gap in our economy where they can hit a blow; just as is the case with our military power. Today enemies know that Iran can fight, defeat enemies in region with precision-guided missiles. I don’t know a state in region, maybe in world worse than Saudi regime: despotic, dictatorial, corrupt, tyrannical & dependent. If they build nuclear plants & missiles for Saudis, I won't worry; because I know in near future those facilities will be captured by Muslim strivers. On #JCPOA, a 7-signatory agreement was achieved. One party i.e. U.S. withdrew. European partners had the responsibility to stand up to U.S. Not only they didn't do so, they practically withdrew from it & imposed new sanctions on Iran while they insisted we stay with JCPOA. Politics & power in Western states including U.S. & Europe are oppressive, bully, illogical & avaricious. They don't get any logic. From within, Western politicians are barbaric. Don't be surprised! They're well-dressed with suits, ties & perfumes, but they're barbaric. To EU politicians & media, massacre of Muslims in #NewZealand wasn’t a terrorist attack; they call it an armed attack! Wherever there’s a movement against someone supported by West, they talk of terrorism & human rights. But in this case, they won't openly call it terrorism. Tomorrow, we Iranians—and others in our region and beyond—celebrate Nowruz, marking the coming of spring and the beginning of our Persian new year. It testifies to the character, spirit and magnanimity of our people that they celebrate amid unprecedented, inhumane and illegal sanctions and pressures. Indeed, despite the medieval tactics employed by the U.S. to destroy their livelihoods, they are unwavering in their sense of hope. This is of course not new: as our people have shown seven consecutive American presidents, we Iranians don’t just persevere in the face of adversity. Rather, we seize on it as an opportunity to reinvent ourselves, and to advance. Nowruz represents the culture of constant renewal and hope. We not only celebrate the renewal of nature, but resolve to renew our thoughts, deeds and efforts for a brighter future for ourselves, our loved ones, our nation and indeed our planet. This year, we in government are at the forefront of this tradition as we reaffirm our endeavor to do better for our people – whether at home or abroad. In the coming year, Iranians will experience the dividends of an emerging economy of resilience that will increasingly shield their livelihoods. This economy will be signified by greater connectivity, efficiency, transparency – and perhaps most importantly, accountability. In parallel, we will continue to engage with our partners to, brick by brick, dismantle the inhumane wall that the U.S. administration has labored to erect around us. Make no mistake: We rely solely on our own people to overcome any challenges. But we also welcome constructive engagement, including with the expanding array of nations who are equally sick and tired of the bullying of the U.S. Whether via closer engagement with our neighbors or our partners in the nuclear deal and beyond, we will continue to assume our place as a safe and reliable center for trade and commerce in a troubled region. We are under no illusion that the path ahead is easy, but I will remind those who wish us harm that Iranians have celebrated more than 3000 New Days - and will celebrate countless more before submitting to outside diktats, let alone those issued by an increasingly isolated power, which is today out of touch with the realities of our post-Western world. Click here for Nowruz messages from President Trump and other Western leaders.